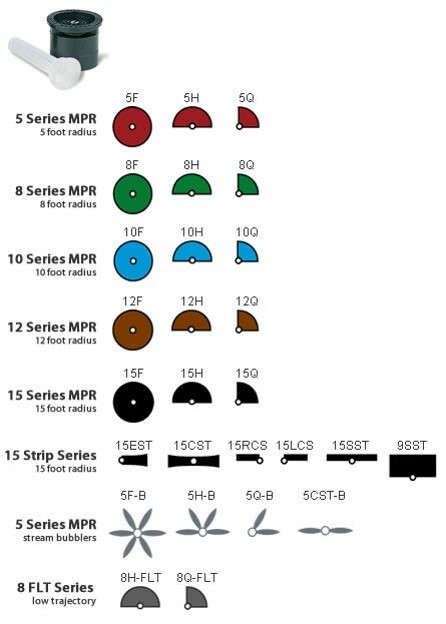 Rain Bird MPR Spray nozzles are color-coded on the top to enhance your productivity. Series for even water distribution and design flexibility. 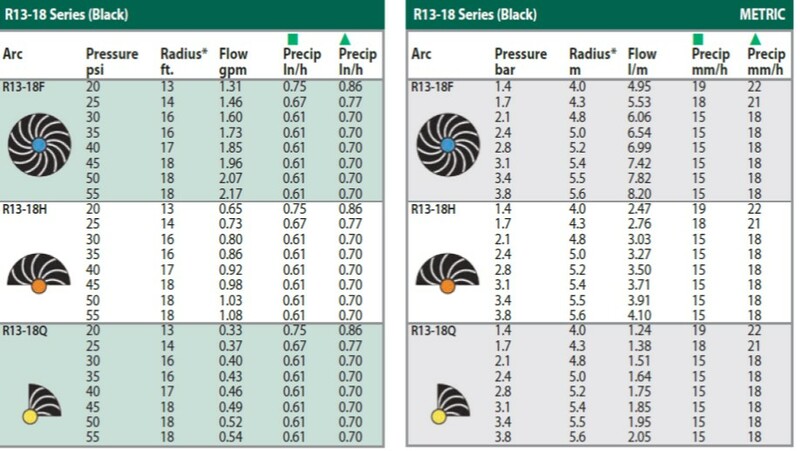 * Rain Bird recommends using 1800 PRS spray heads to maintain optimum nozzle performance in higher pressure situations. Rain Bird® VAN Nozzles can be adjusted to the exact pattern of your lawn, ensuring your landscape will be precisely watered, so you don’t need to worry about it. They are ideal for odd shaped corners and smaller grassy areas around sidewalks and driveways; they can also be used for watering flowerbeds or shrubs. A complete line of VAN nozzles is available covering a range from 3-18 feet. No special tools required. A small twist of the center collar increases or decreases arc setting. Quickly identify radius with Top Color-coded™ nozzles. Top Color-coding makes it easy to verify proper nozzle installation, even when system is not operating. 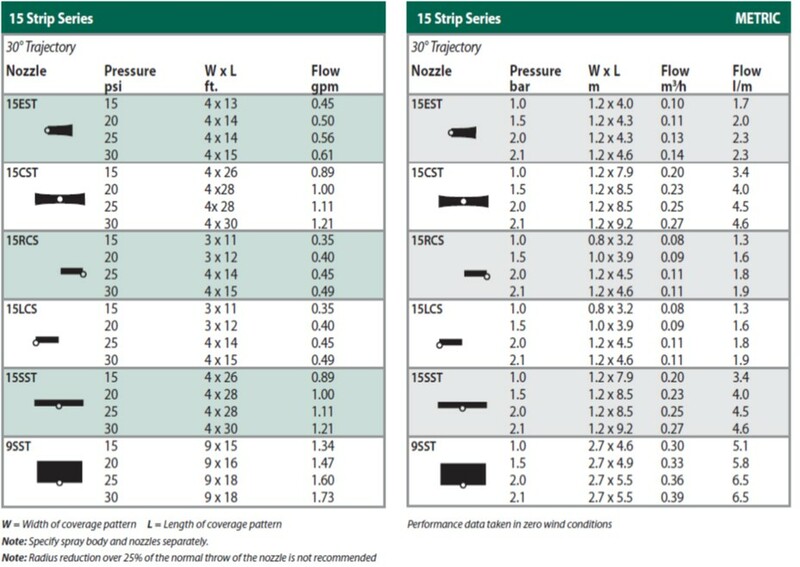 * These ranges are based on proper pressure at nozzle. 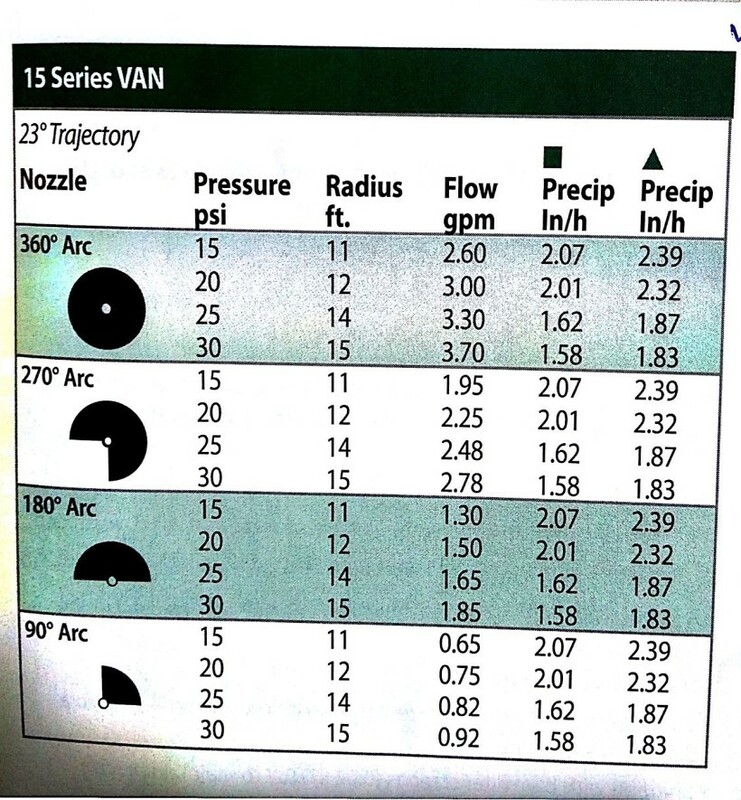 12-, 15- and 18-VAN have matched precipitation rates with Rain Bird MPR nozzles. ** Rain Bird recommends using 1800 PRS spray heads to maintain optimum nozzle performance in higher pressure situations. Rotary Nozzles provide unsurpassed design flexibility and highly efficient water distribution from 13 to 24 feet. The Rotary Nozzle is a truly remarkable innovation with a low precipitation rate, highly uniform distribution, and increased radius range, all in a nozzle which fits on a Rain Bird spray head. Low precipitation rate – 0.60 in/hr (15,2 mm/hr) – reduces run-off and erosion. Multiple, rotating streams uniformly distribute water throughout the radius range. Matched precipitation rate across radii and pattern simplify the design process. Matched precipitation rate with Rain Bird 5000/5000 Plus MPR Rotor Nozzles allow MPR irrigation designs from 13' to 35'. With approximately 60% less flow than conventional spray nozzles, Rotary Nozzles allow more heads per zone, reducing overall system complexity and cost. Maintains highly efficient performance throughout the 20-55 psi pressure range, with no misting or fogging at high pressures. Stainless steel radius reduction screw allows reduction down to 13' on the R13-18 and to 17' on the R17-24 to accommodate varying landscape needs. 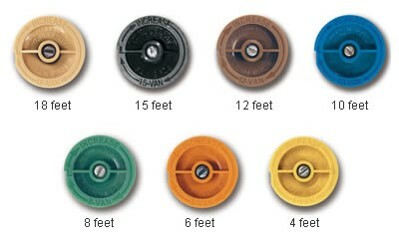 Rain Bird Rotary Nozzles offer color-coded top plugs to help you quickly identify the arc/pattern. The Rotary Nozzle shall have multiple arced streams and have a matched precipitation rate of 0.60 in/hr. The Rotary Nozzle shall be constructed of UV-resistant plastic. The radius adjustment screw shall be of stainless steel.